Those Argentineans sure do know how to cook their beef. 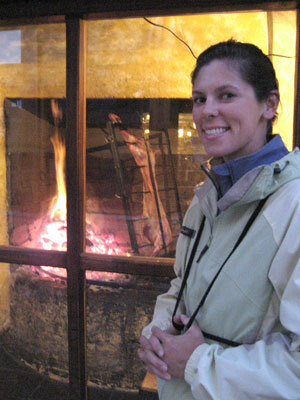 The first time I tried the Argentine asado I was hooked…maybe even addicted. The cravings would come back to me on random occasions. Just one whiff of the incredible meat being cooked would kick my senses into gear and I found my eyes wandering and my mouth drooling over the incredible smell. One of these occasions hit me while walking the streets of San Martin de los Andes, a beautiful small Patagonian town in the Andes of Argentina. I was enjoying a nice stroll through town with a friend – with no intentions of eating out that night – when the waves of flavor drifted my way and drew me in. I followed the smell to the doors of Ku and there was no turning back. From the street window we got a first glimpse at the meat being prepared over the fire and without a second thought we walked straight into the restaurant. From the outside Ku appears to be somewhat small but as we entered the place opened up, the ceilings raised high, and the dim lighting in the wooden building created a perfect ambiance for a fun evening. 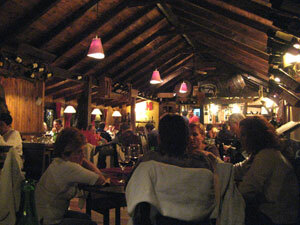 The atmosphere lends itself to any dining experience one may be looking for. The two of us enjoyed our meal and were soon conversing with the table of local women next to us who were out for a fun girls’ night on the town. In the dark corner tables one could find the couples enjoying a romantic dinner, and even the hungry men flying solo for the night were able to enjoy the great food and get enough to satisfy their big appetites. We jumped in the bench seats next to the window and we were promptly given a wine list to get us started. Their wine selection is extensive and is accentuated with the bottles from the incredible wineries of Argentina that adorn the walls throughout the restaurant. We settled on a Malbec from Trapiche and were very impressed with the flavor and perfect match we found for our feast. Then came the meat. There were not many words spoken throughout this part of our meal as we were too distracted by the food that sat before us. There were plenty of options on the menu ranging from big salads to fancy chicken dishes but we decided to go for the traditional beef. When in Argentina do as the Argentineans do. I had eaten many Argentine asados up until this point but this one topped the charts. The taste of my bife de lomo was even more satisfying than I had imagined by the smells that pulled me in. 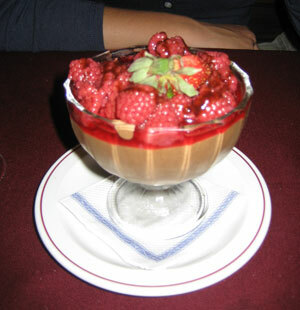 To balance off the meal we made one more order of a chocolaty mouse dessert that was topped in strawberries. It’s gotta be good if it merits its very own picture. One thing is for sure, when eating at Ku you will not leave hungry or disappointed. Just got back from san martin. i had the lamb asado. The best lamb I’ve ever had. Crunchy crackeling crispy on the inside tender and jucy on the out. Loved ku ate there twice. Awosme place awosome time. This page rendered in 0.696 seconds.